For more than two decades, Australia has locked up people who arrive here fleeing persecution - sometimes briefly, sometimes for years. 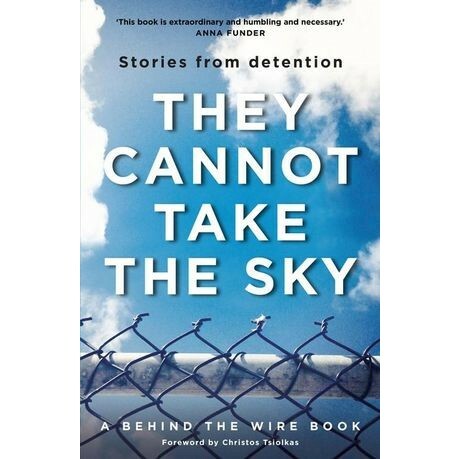 In They Cannot Take the Sky those people tell their stories, in their own words. Speaking from inside immigration detention on Manus Island and Nauru, or from within the Australian community after their release, the narrators reveal not only their extraordinary journeys and their daily struggles but also their meditations on love, death, hope and injustice. Their candid testimonies are at times shocking and hilarious, surprising and devastating. They are witnesses from the edge of human experience. Behind the Wire is an award-winning oral history organisation. It works with men, women and children who have sought asylum in our community and who have experienced mandatory immigration detention in Australia, Papua New Guinea or Nauru. Its projects include a book, audio book, podcast, museum exhibition, listening parties, and photographic portraits.